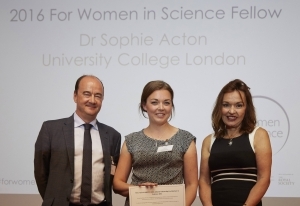 The applications for the L’Oreal for women in science fellowships 2017 are now open! As a winner of one of these awards in 2016 I have had many postdocs reach out to me asking for advice on their applications, and been asked ‘what’s the trick to getting the interview?’ Well I don’t know about any trick, but I can say that I decided to go with the approach of honesty, and so I wrote my candidate statement in one sitting, with just a quick check for typos, and then I submitted my application without letting anyone read it. This is what I wrote…. Best of luck to all of you applying this year! My career path to date looks rosy, simple and perfectly planned. Great publications, perfectly timed and in press ready to win amazing fellowships. Two pregnancies and extended maternity leave (twice) slotted in easily between big projects. No time lost, no opportunities missed. It’s best to project that perfect image of success, but in reality there is no magical perfect timing, only hard work. There is no firmer deadline or greater motivation than a fixed due date. I have run critical final experiments into the night when my daughter was just 10 days old. I have written my career development fellowship applications in cafes, religiously rocking the pram back and forth trying to ensure I could get an idea written down before my baby wakes up and my thoughts scatter. I have found ways to be productive with one hand, laptop one side, breastfeeding a newborn on the other. I have attended interviews on minimal sleep, balancing my worry over my son’s reflux and lack of weight gain with the pressure of facing the committee. I have been torn between split personalities, and at times struggled to find myself whilst overwhelmed with motherhood. I write this now sat outside my daughter’s ballet class. Finished or not the laptop will be discarded soon and Dr Acton will take a back seat while Mummy takes over again. An academic career is highly competitive under the best circumstances. To survive and thrive despite the distraction of small children is no small feat, and I am extremely proud to still be here. However, when you do manage to pull everything together, there is no prize, only expectation of continued success. I have resented this, and resented my colleagues who faced the same professional hurdles free to indulge in their work without their hands tied as mine have been. Despite this, I have never considered another career. I re-returned to work 4 months ago. This time I know what to expect; spending most of my salary of childcare while my son collects every virus that London has to offer. There is no way around the unexpected phone calls from nursery and many days of sickness, it is another difficult phase that I will do my best to navigate. However, I will soon leave the security of my postdoctoral lab to begin independently. Without a university position, I must prove I can manage, mentor and drive others to achieve in the short few years of my career development fellowship to then hopefully be offered a permanent post. This transition is a critical period for me, more than any other to date. This award would give me flexible funding that I would use to raise my profile, set aside time to generate novel ideas within the group, and also ease the financial strain of raising two young children in an expensive city. However, more than anything, I value the recognition of this prestigious award, and the support of other women who have succeeded in this game. I lost my histones…. what does this mean?